In the section entitled “Beginnings,” Ix’ises initiates her story of how she came to know her future husband Job, and how her early life intersected with his. In her last few days of life, as she looks back over all that has happened, she is actually relating two separate but gradually converging story lines. The primary story line is told in the main text of the book, proceeding along the timeline of her life. The poetical chapter introductions comprise the secondary story line, which begins with her rage at God after the death of her children, following her struggle to work through her bereavement. The Bible says little about her life before Job and nothing at all about her upbringing, so of course this tale is entirely fictional. However, it does raise a myriad of questions to consider, especially before condemning her for her fateful words in his time of need. 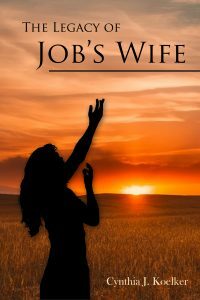 What do you think Job’s wife would have been like? Below are many of the questions that are addressed as her story unfolds. When would Job’s wife have met her future husband? How long had she known him? What was their relationship like before marriage? In what sort of a family was she raised? What was Job like as a child? Did either family share Job’s faith in God? As a child how did she react to problems in her life? Was her upbringing a happy one? In what sort of environment did she live? Since the book of Job features wonderful poetry, could fine literature have figured in her life? How were stories passed along? How and when did Job’s friendship with Eliphaz, Bildad, and Zophar come to exist? Was Ix’ises simply the mother of Job’s ten children, or might she have had interests of her own? Would she likely be a strong person? A loving one? Did she actually love the man she later urged to curse God and die? Perhaps you’ll have additional questions to contribute in the comment box below.